I love all of the bright colors and tassels! So cute! I just love all of the bright colours and the tassels! Love these spring shoes and bags! Number two is my favorite!! love the pom pom bag as well! Great post, girl! I am dying to buy these! I think they will be my summer sneakers! I love tassel everything those days! Great selection! #3 by Rebecca Minkoff is my absolute favorite! Yessssss, loving these picks- so bright and gorgeous and PERFECT for summer! OMG you are killing me with this list! I want EVERYTHING! These picks make me all want to be on vacation right now! So fabulous! Honestly I love every single one, and have been on the fence about getting that Sashi bag... too cute! Me too - it is so fun & under $100! Worth it! OMG, I will take one of each. I have been eyeing #9 for a while and it might have to be my big gift to myself for my birthday coming soon. I also will get some fun Soludo espadrille flats. I love everything on the first row, as well as #s 5, 8 7 11. Are you enabling me Michelle? I LOVE that bag too! It is towards the top of my wishlist! 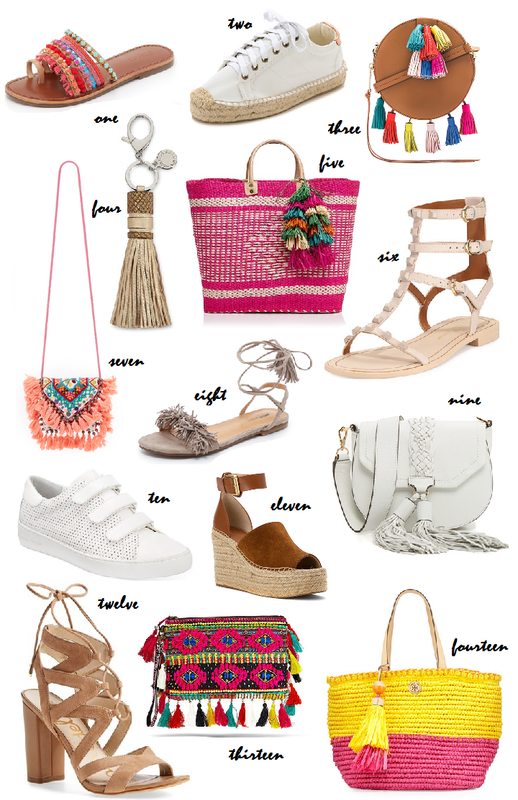 I am also in the market for some new espadrilles & I love the sneaker pair!